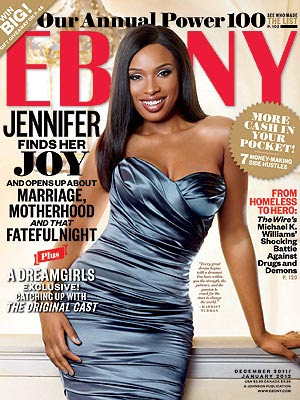 Jennifer Hudson shows off her new slimmed down and toned figure on the cover of Ebony magazine's December 2011 issue. Inside she opens up about the tragic day in October 2008 when her family was murdered and how the last minute decision to fly to Florida to visit her fiancee saved her life. Scarlett Johansson goes dark and daring on the cover of Interview magazine's December 2011 issue. Shedding her usual ultra feminine style for a more high-fashion modelling and barely recognizable look. Photos via Interview and Ebony. Which Magazine Fab cover do you prefer? Leave a comment below. wow look at Jens body she lost a lot of weight. Scarlett looks a bit like Gaga in the face. That must have traumatized her poor girl but she has a son now adn her career is better than ever. I love how she still looks so healthy after loosing weight not like those stick thin celebs. Is that really scarlett what did they do to her photoshop over kill. Jhud is glowing happy for her. Must be sad around this time of the year thanksgiving christmas and no family.